We Offer a wide selection of music from a cover band, or corporate show, wedding reception band, function band, jazz ensemble, duo or trio. 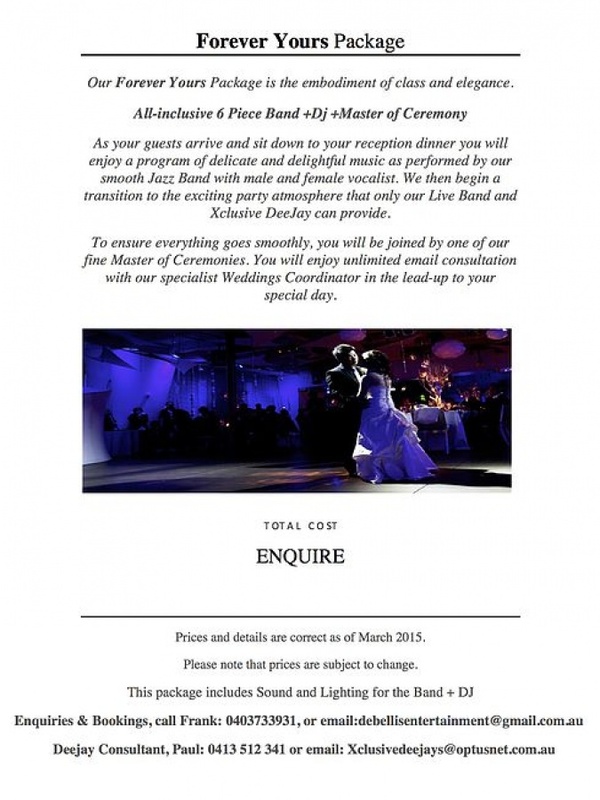 De Bellis Entertainment and Xclusive Dee Jays specialise and are able to tailor your entertainment for your big day. Entertainment you choose for your wedding will have a large impact on how you and your guests enjoy and remember your special day and its because of this that we will go out of our way to ensure we provide the right entertainment for you at the right price. Our Wedding Bands, MC's, and DJ's are some of the best Entertainers in the business. NEW ITALIAN BAND WEBSITE CHECK IT OUT COMING SOON!